BEIJING, Jan. 15 (Xinhua) -- Usually in people's minds, the Great Hall of the People in Beijing is a place for convening important meetings or receiving distinguished guests. Yet on January 14, a hall in the west wing of this building was adorned with decorations of ice and snow, in preparation for the inaugural ceremony of the 2019 China-Finland Year of Winter Sports. President Xi called for enhanced cultural and people-to-people exchanges as the two presidents jointly launched the event in the hope of "forging a model of winter sports cooperation" on Monday afternoon. There would appear to be huge potential for cooperation in winter sports between the two countries. Finland is well established in winter sports training and competition, while China is home to a booming number of winter sports lovers and will host the 2022 Winter Olympic Games in Beijing. Sporting ties between China and Finland stretch back to the middle of the last century. The People's Republic of China made its Olympic debut at the 1952 Games in Finland's capital Helsinki, which was the first venue to witness China's national flag being raised at an Olympic Games. And in Helsinki in 2017, the Chinese duo of Sui Wenjing and Han Cong took gold in the pairs competitions at the World Figure Skating Championships. Winter sports cooperation is a highlight of the Finnish president's China trip. 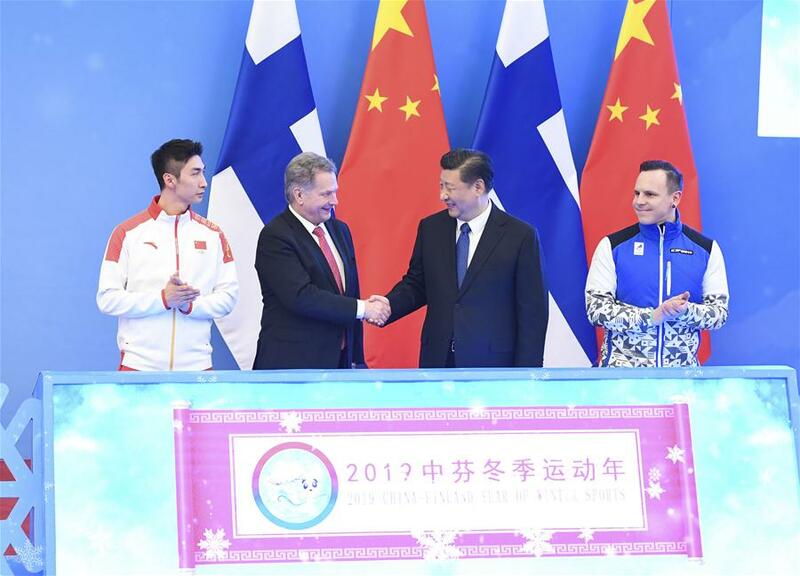 On Tuesday evening, Niinisto attended the opening ceremony of the China-Finland Year of Winter Sports 2019, along with Chinese senior officials. "China is on the way to becoming a big power in winter sports and Finland is willing to lend a helping hand," said Niinisto in an interview with Xinhua on the eve of his China visit. During his visit, Niinisto expressed his happiness that Finland would be the first country to launch into a Year of Winter Sports cooperation agreement with China, adding that he believed this would further promote friendship between the two countries. On Monday, the two sides published a joint action plan (2019-2023) on promoting the future-oriented cooperative partnership. A series of measures for promoting winter sports cooperation are underway, including establishing a China-Finland winter sports department at Beijing Sport University, a leading sporting institution of higher learning in China. Zhu Jing, deputy director-general of the Department of European Affairs of China's Foreign Ministry, said that during the new year, the two sides would jointly host over 40 events, including personnel training, games organizations and sports research. China has overseen a robust development in winter sports as it prepares to host the 2022 Winter Olympics and Paralympics in Beijing. Last December, China's State Council released guidelines to speed up the development of the sports industry, aiming to grow it into a two trillion yuan (290 billion U.S. dollar) industry by 2025. China aims to engage 300 million citizens into winter sports by 2022, as laid out in an ambitious plan formulated by State General Administration of Sport in 2018, with a view to improving the standard of health across the country. "That enables Finland to provide a lot in terms of infrastructure construction," said Sampo Terho, Finland's sports and culture minister. Eight million people in Beijing are expected to participate in winter sports by 2022, and city authorities have established special associations for ice hockey, curling, ice skating and skiing. Business Finland, the country's official export promotion organization, has organized a Winter Sports Cluster Program involving public and private sports industry. "The program aims to take the expertise and products of the Finnish sports industry to China, and provide innovative and energy-efficient solutions," said program head Petri Tulensalo. "China's winter sports has seen rapid development, which demonstrates China's social and economic progress and offers huge cooperation opportunities for cementing people-to-people ties with the outside world," Victoria Liu, executive president of Winter Games Association International, told Xinhua. In addition to Finland, China has also sought to use the knowledge and experience from other countries with a rich history of winter sports. In talks between President Xi and Norwegian King Harald V in Beijing in last October, President Xi said that China welcomed Norway's experience and assistance in preparations for the 2022 Winter Games. Since May 2017, when China and Norway signed an action plan on sporting exchange activities, the two countries have unveiled a series of cooperative measures. As of last October, over 100 Chinese athletes in the fields of cross-country skiing, biathlon and ski jumping have received training in Norway, and Norway has sent its table tennis players to train in China. The National Hockey League (NHL) is also working to establish an ice hockey culture in China by bringing professional hockey players and matches to Chinese audiences. According to an NHL report, the league's China strategy is twofold: targeting business opportunities that will grow the league's brand globally, and helping the game grow in China in advance of the 2022 Beijing Olympics.